An Old Fashioned Christmas in Ocean City, NJ! An Old-Fashioned Family Christmas in Downtown Ocean City is scheduled for November 24th, the day after Thanksgiving. Asbury Avenue, 6th-11th Streets, will be full of holiday spirit and entertainment to accompany everyone’s holiday shopping experience beginning at 2pm. 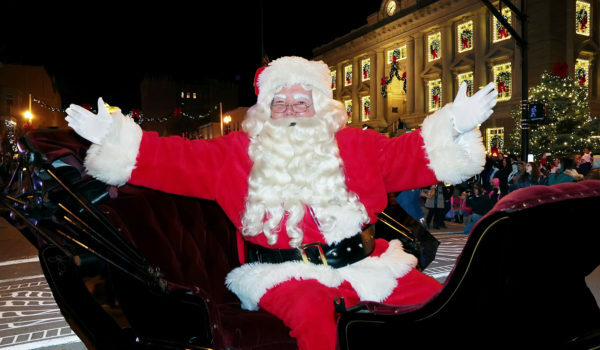 Features of the day will include visits with Santa in the gazebo at the Mark Soifer Park across from City Hall from 2 to 4pm, a special appearance by the Phillie Phanatic from 4 to 6pm, Carolers in Victorian costumes, free horse and carriage rides from 1-4pm, and other entertainment on Asbury Ave.
Michael Hartman from the Greater Ocean City Theatre Company and other talent will gather on City Hall steps at 4:00pm to lead the audience in singing Christmas Carols in preparation for Santa’s arrival at 5pm. At 5pm, the Christmas Tree at City Hall will be lit. Then Santa will arrive in Ocean City just like he did years ago. The Jolly Old Elf will descend from the roof of City Hall with the assistance of a Fire Department Ladder Truck. This dramatic entrance is nostalgic of days past; a tradition that began in the 1960’s. Downtown shop keepers and restaurant owners will be open late offering discounts and free holiday spirit. The event is sponsored by the Ocean City Regional Chamber of Commerce, Downtown Merchants Association and the City of Ocean City. For information, contact the Ocean City Chamber of Commerce at 1-800-BeachNJ or visit online at www.OceanCityVacation.com. The Annual Downtown Christmas Parade will take place on Friday, December 1st at 6:00pm along Asbury Avenue in Downtown Ocean City. Floats, bands and of course, Santa Claus will all be present!